Since I was a child, my aunt made her nieces and nephews ornaments every Christmas. I waited patiently every year to see what our ornament was going to be. Every year the ornaments were unique and showed my aunts love of sewing and craftiness. 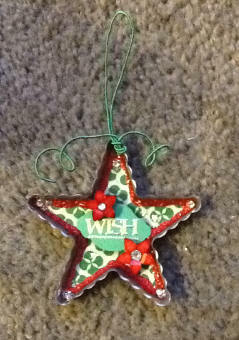 Even during her illness, she made sure she made us all an ornament. They all hold a special place in my heart , especially since 2011 was the last year I would receive an ornament. My aunt passed away July 18, 2012 after a courageous battle with endometrial cancer. 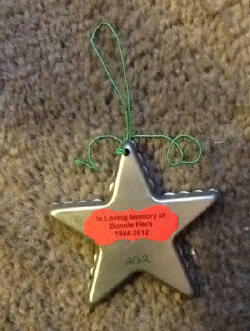 Something told me I could not let 2012 pass without making an ornament in her memory. I used a silver star cookie cutter, washi sheet (traced and placed inside the cookie cutter), acrylic flowers, red and silver glitter glue, memory thread, petite dazzles and silver baby bling. I'm very pleased with the outcome of this ornament and know that my aunt would've loved it. My creative juices stopped flowing for a while, as I lost my grandmother, December 31,2011 and then my aunt in 2012. Within six months I lost two very important people in my life. I'm trying to get back into creating my cards. I know my aunt and grandmother would not want me to stop creating my cards. They loved the cards I made for their birthdays.